Booking a seat on the coach is essential. Booking for Saturdays - Phone or Text (Julie) on 07498-662940 (between 4:00 pm - 7:00 pm, any day) Booking for Sundays - Phone or Text (Hilda) on 07546-529704 (between 5:00 pm - 7:00 pm, any day) To book on a walk just phone either of the above numbers. Please bear in mind both are unpaid volunteers, so limit your call times to those shown above. Bookings can be made from either two or four weeks prior to the ramble, no bookings are accepted in advance of that. Bookings can be made up to the day prior to the ramble. Bookings can be cancelled up to the Wednesday before the ramble. Bookings not cancelled by Wednesday will lose the fare, bookings made after Wednesday must pay. Any seats that are booked and not occupied must be paid in full as soon as possible. Fare refunds are available in certain circumstances on written application to the General Secretary. Fares shown are subject to revision as necessary. Juniors (under 15) will be charged Half Adult Fare. Seats may be booked for the next outing whilst on the coach (payment is required when bookings are taken on the coach). We offer "B" and "C" graded walks to Saturday destinations, and "A", "B" and "C" to Sunday destinations. A general guide is "C" = EASY (Ideal for beginners) (Saturday 6 miles) (Sunday 7 miles): These walks are intended for beginners and those who want a more casual stroll in the countryside. The route will include unsurfaced rural paths, some stiles to climb over and possibly some up hill walking. The groups walking pace will be fairly leisurely to allow the slowest walker to keep up. 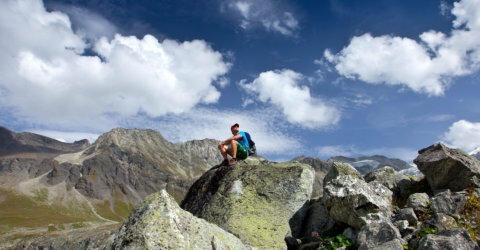 Many "breather" stops will take place so you can have time to admire the views. A lunch stop at the middle of the day will also be planned. Walking boots and warm, waterproof clothing are recommended. "B" = Moderate: (Saturday 8 miles) (Sunday 10 miles): These walks are intended for people with some country walking experience and a reasonable level of fitness. They may include some steep paths and open country. A steady pace will be maintained. Several stiles may be encountered on the route. 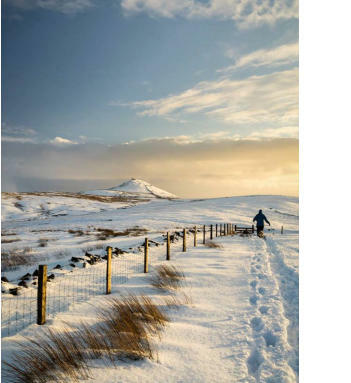 Walking boots and warm, waterproof clothing are essential. 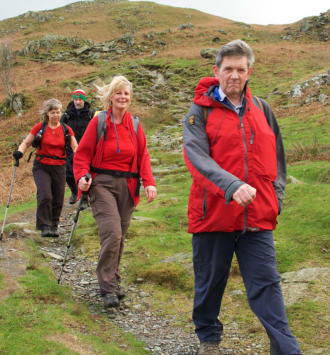 "A" = Hard (12 miles): These walks are intended for experienced walkers with a good level of fitness. They may include hills and rough country, and may be at a brisk pace. 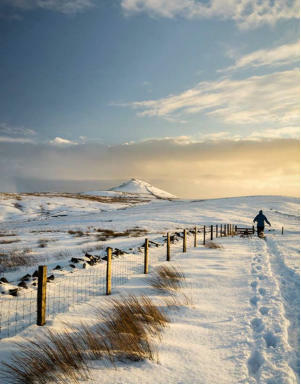 Walking boots and warm, waterproof clothing are essential. People in doubt about their fitness are advised to speak to the walks leader in advance. note: Please do not attempt a Higher grade of walk than you are confident of completing in the time available, if in doubt discuss with the leader of the walk. For more excellent photographs have look at our “Gallery” page here. • A right of way is a path which anyone has the right to use on foot, and sometimes using other modes of transport • Footpaths are open only to walkers; bridleways are open to walkers, horse riders and pedal cyclists. • There are 117,000 miles of rights of way in England • There are 20,000 miles of rights of way in Wales • All rights of way are shown on legal “definitive maps and statements” which are looked after by the relevant council • The highway authority (county council or unitary authority) has a duty to look after rights of way and to ensure that they are well maintained, unobstructed and well signposted.